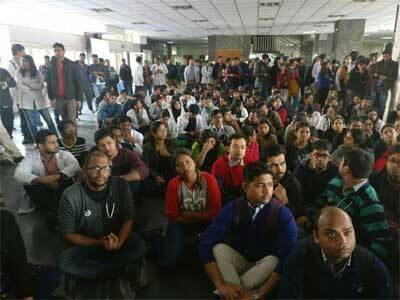 Opposing the authorities action, Resident Doctors Association (RDA) of AIIMS threatened to go on strike, yesterday. 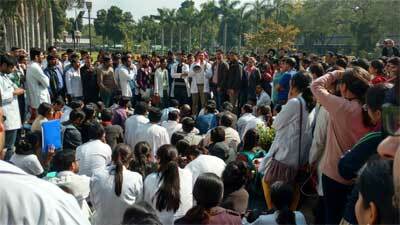 A meeting with the administration, Nursing union representatives and the RDA AIIMS was held in the Director’s committee room in February 6,2017 at 4:30 pm, following which the RDA AIIMS announced that a consensual decision was taken that the suspension orders against the five resident doctors will be revoked with immediate effect. “As mentioned in the letter submitted by the RDA AIIMS yesterday, in the current scenario, we are left with no alternative but to with hold all outdoor and indoor patient care services with immediate effect.We also notify that if no rightful action taken in the next 24 hours, we will be forced to shut own emergency and critical care services as well, w.e.f. 8.00 am, February 8, 2017.We demand immediate revocation of suspension orders and a written apology for defining and harassing the involved residents.” said Dr Vijay Gurjar, President RDA AIIMS. Enter your comment here… Argument/fight between brothers & sisters!? Really shame. There should never be a misunderstanding between at least us(with public,its never ending!). 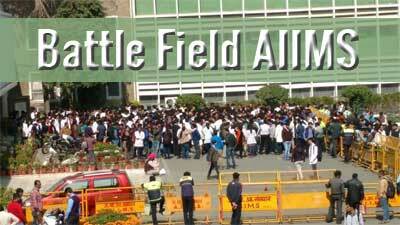 We need to be faithful mutually.Hope both the groups behave themselves. Both sides seems to have no rerpect/belief in due process. HOD and other seniors in the Dept Of Anaesthesiology should have shown the guts and moral responsibility to defend the juniors.It is really sad that SR and JRs have been made Scapegoats.The Dept will never be able to live down their cowerdice.They should have shown the guts to face legal recourse.